An actuary is a highly trained statistician with expertise in evaluating various types of risks. Roughly 60% of actuaries are employed by insurance companies, and play a key role in setting the terms and conditions of insurance policies, including premium rates. An actuary also has career opportunities in pension fund management, forecasting future payouts and determining current contributions and investment policies in light of them. Additionally, actuaries (either in-house or consultants) help companies in all industries design and implement policies and procedures to mitigate risks in various aspects of their operations. Use this tool to search for current job openings in this field. An actuary is expected to have at least a bachelor's degree. There is prescribed coursework in statistics or actuarial science (a branch of applied statistics), plus business, finance, and economics. A high degree of computer literacy is increasingly important, especially with regards to software packages commonly used for database and statistical analysis. An MBA can be a useful credential, depending on the firm. The Society of Actuaries (SOA) certifies actuaries in life insurance, retirement plans, and investments. The Casualty Actuarial Society (CAS) certifies actuaries in property, casualty and liability insurance. Reaching the highest level of certification is a lengthy process, requiring coursework and the passing of nine separate exams normally over the course of six to nine years. 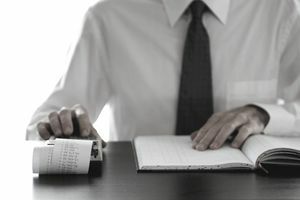 Three of the first four exams are common to both the SOA and the CAS tracks, allowing the prospective actuary some time to decide on his or her specialty. The job of actuary involves detailed analysis of data to quantify risks. It also requires expertise with advanced modeling techniques to forecast future probabilities of various outcomes, such as losses or claims and their expected magnitudes. While technical expertise and quantitative skills are a must, advancement is dependent, to a great degree, on the ability to communicate effectively with managers who lack this background. Do not confuse an actuary with an insurance underwriter, who evaluates applications for insurance, and makes decisions on whether to accept or reject them. An actuary works at a more macro level, setting the high-level parameters that guide insurance underwriters. The typical actuary works close to a standard 40 hour week, normally from a fixed office location. A consulting actuary tends to have significant travel, and thus may work considerably longer hours. An actuary is a highly respected professional who is an important influencer of company policy, if not a final decision maker. It is a well-compensated field that has a vital, visible impact. For those with ambitions to rise in general management, the opportunities may be limited in some companies, which might view an actuary as a narrow specialist. Also, depending on the company and the position, the work of an actuary may become somewhat repetitive and lacking in variety. Per the Bureau of Labor Statistics, median annual compensation was $93,680 as of May 2012, with 90% earning between $55,780 and $175,330.